I know that the web has been around for more than 20 years. I have to admit, I am truly amazed at the Internet’s power. One day I send out an article, and the next day I have dozens of readers sign up to receive more. When I was featured on television, which has been my home for 30 years, I would do a program and it was gone. Now I put an idea on the Internet and it’s possible that it will last a lifetime. As a result, it is my goal to take the material that I have shared with millions over the years and get it on the Internet. I’m hoping more people can take the information and share it whether you are spending time in the backyard, camping with your favorite group or with your families as you enjoy the great outdoors. Today I want to share with you another one of my favorite recipes and it’s amazingly easy. It’s how to make ice cream in a can. One day when I was spending time with my family, I put out three different flavors of milk and some whipping cream, and I honestly think they came up with 30 flavors of ice cream — well at least ten! They spent the afternoon making Ice Cream in a Tin Can. 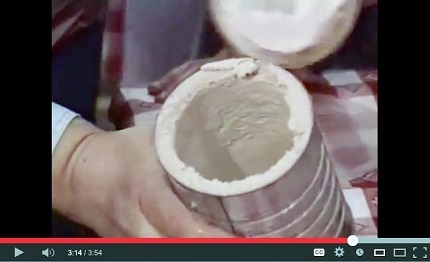 See a video on how to make tin can ice cream. In the small can, add milk, cream, sugar and syrup. Do not fill the can more than half full with ingredients or the ice cream will not freeze as well. Cover the small can with a plastic lid and place it into the large can. Fill the bottom half of the space between the two cans with ice. Add rock salt. Fill the rest of the space with ice and put on the plastic lid. Ask two people to roll the can back and forth to each other for 10 minutes. (You might want to set a timer because small children have little concept of time.) Remove the lids and scrape the ice cream from the sides of the small can. Stir the mixture. If the ice cream needs to freeze longer, pour any water out of the large can. Set the small can inside the large can, adding more ice and rock salt as needed. When the ice cream is ready, there will be about a half inch of frozen mixture on the sides of the can (the rest still in near-liquid form). With a kitchen knife scrape down the frozen ice cream and stir it into the liquid ice cream to create the right consistency. Makes about 2 cups. Tip to freeze ice cream faster: Chopped frozen fruit can be added with the mixture, which will speed up the freezing process. Dian’s Outdoor Special: If you would like to add these fun and easy ideas to your list of exciting things to try this summer or during an emergency, check out the special for Roughing it Easy, Recipes for Roughing it Easy, with a bonus DVD on how to cook in a Dutch oven for just 29.99 regularly $49.97. It is filled with practical and down-to-earth suggestions for wonderful outdoor adventures. Go to www.dianthomas.com.